Among all the demands of everyday life, the most successful people prepare in advance for anything that is important in their life. Fueling your body doesn’t get any less important by putting it off. Instead it just causes stress, high grocery bills and regret… oh lots of regret. So we have done some of the work so you don’t have to! Here are 17 of the most clever meal planning tools we have ever found. Also included, some of the creators provided excellent tips from their own experience meal planning. And the best part is that they are free! Bullet journals are fantastic for anyone looking to keep track of day-to-day lists as well as their calendar. Productive and Pretty shows you 15 excellent ways that you can use your bullet journal for meal planning at well! 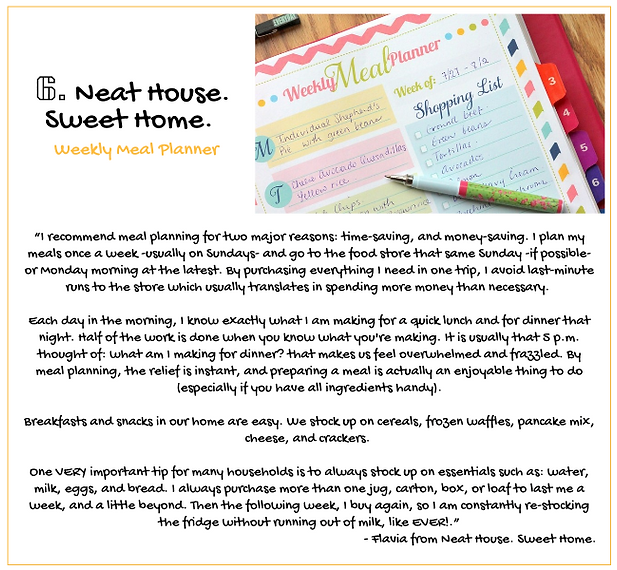 With 4 comprehensive templates that all work together, The Modern Nest has designed the most comprehensive system for meal planning I have seen. This planner will keep you organized from start to finish with meal prep, shopping and cooking. 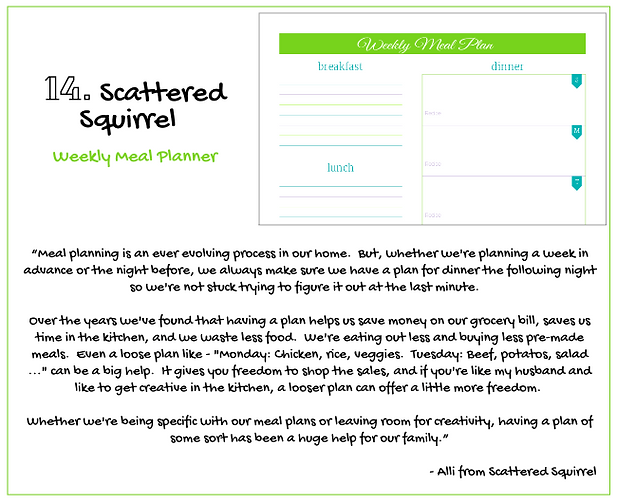 Make sure you click on the graphic above, or follow this link and subscribe to her email list to get your copy of this amazing meal planner! Super cute and simple! This planner’s design has everything you need to start meal planning now, in just 1 simple and concise form. For those of you out there like myself, I appreciate how visual the horizontal format of this planner is. Even if you only rely on only a handful of different favorite recipes, this planner will easily allow you to rotate through those and add variation to your schedule! Check out the Gingered Whisk’s blog by clicking on the graphic above or on this link. You don’t want to miss their step-by-step process on how to meal plan, she does such an excellent job – talk about making DIY meal planning attainable for everyone! This super fun and bright coloured planner has me so excited for you! Flavia at Neat House. Sweet Home. did such a great job designing this beautiful planner. Not only does it make planning for your week ahead easier, but post it in your kitchen as an easy reference throughout the week. So unbearably cute! Heartmade features beautifully creative artwork, and their meal planner is no exception! Not only does this planner have the greatest grocery list which is broken into categories that will make shopping a dream. It comes in green as well! Click on the link above or follow this link to see both colour options. A beautifully clean design and well laid out, she planner would be great for those with a busy schedule. Tip: Before you start planning recipes, first check your schedule and crossing off the meals that you won’t be home for. Then with those out of the way and a better picture on what your week will look like you can plan longer cooking meals for the days you know you will have time, and quick or no-cook meals for those nights you know you will be rushed. Another fun and super bright and energizing template that will help you get straight to work. With the addition of the “other” column this works great in helping keep all your spending on budget. Plan ahead for all your shopping expenses (ex. coffee, home items, clothes) and decrease the amount of frivolous spending for your upcoming week! Such a great idea! Talk about making thinking of new meal ideas super easy when you can just do it this way! Create a sticky note for each idea or recipe you have. Then just circulate all your sticky notes each week and keep your diet fresh week after week. Love the colouring and design of this template! A cute and simple meal plan, with a great long list for keeping your grocery list. Click on the graphic above or on this link to see the extra spot at the bottom of the template for extra items like potluck dishes you need to bring elsewhere or snacks. Great advice and love the unique layout of this template. This one is very different from the others, and unlike any of I have seen before. This one is great for all of you out there that are just like me. We eat the same couple of things for breakfast each week and then leftovers for lunch. You don’t need separate areas for these meals each day, just a couple of spots for what your plan is and then room for planning out your week’s dinners. With a grocery list of the staples already included – this one is so simple and efficient in helping you start your week off on the right foot. Also, click on the graphic above or follow this link for a free full week meal plan. Great for planning 3 meals, but also for those who are needing to eat more frequently. Fill up each day with as many small meals you need to and enjoy lots of shopping list room! And last, but definitely not least another great meal planner with a grocery list that includes categories for each area of the grocery store. Or… are you wanting someone to create meal plans for you?? We have a quick and easy solution!